An "e-mail" message from aliens inhabiting the Altair solar system could reach Earth within 7 years, some astronomers suggest. The alien message would come in response to a radio-wave signal sent toward Altair 25 years ago by Japanese astronomer Hisashi Hirabayashi, who suggests we may receive a reply as early as the year 2015 if intelligent aliens received, decoded and responded quickly to the message. Altair is located approximately 16 light-years from Earth. Hirabayashi, a former researcher at the University of Tokyo Astronomical Observatory (now known as the National Astronomical Observatory of Japan), along with colleague Masaki Morimoto, sent the message via a US radio telescope in 1983 on the Tanabata holiday, a traditional Japanese star festival celebrating the annual meeting of two stars -- Vega (which represents the goddess Orihime) and Altair (which represents the god Hikoboshi) -- in the night sky. 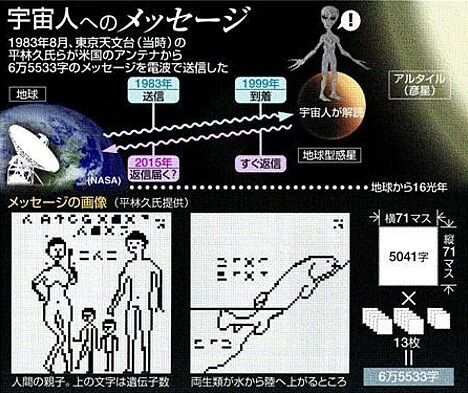 Hirabayashi theorizes that if the aliens are intelligent enough to receive radio-wave signals, they should recognize that the data consists of 13 images and they should be able to send a reply. But Hirabayashi is not holding his breath. "I believe aliens exist, but they are difficult to find," he says. "We haven't even observed any planets around Altair, so it is highly unlikely we will receive a response." Hirabayashi's original illustrations, which went missing for many years, were recently discovered at the Nishi-Harima Astronomical Observatory, where Morimoto works as an advisor. Strangely, one of the pictures sent to Altair includes the molecular formula for ethanol along with the kanji characters for kanpai (the Japanese toast of "cheers!") and the English word "TOAST." "I came up with that idea while drinking," Hirabayashi playfully admits. "The aliens probably won't understand that part." - Kanji character for kampai (Cheers! 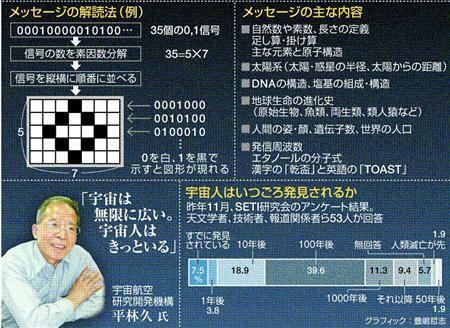 ), English word "TOAST"
He should have sent some kind of encoding of the first 100 primes. Maybe not as entertaining as kanpai but if we share anything at all with alien intelligent life it must include basic arithmetic. Eh, I'm with David Brin on this. It's dangerous to send out signals into space without knowing what's out there. They forgot to mention that once the message was received in the Altair system, it was then posted on several message boards where it was promptly declared as "fake" by extraterrestrial bloggers. I thought I had done some weird "drunk Texting" before! Hopefully the word "Toast", and it's Japanese equivalent don't mean, "Your ugly and your Momma has 10 tentacles." We could be in trouble. we really should consider, in the face of this, NOT disarming, but pointing everything we have at Altair...this is just gonna give me the heebie jeebies for weeks now. Great! OMG!...i hope not the BAD guys!!! if they're then we're totoly DOOMED!....LoL imagine if they're all beautiful WOMEN wow i love it ;P.
they're going to use it against us. Nomnomnom. If aliens out there can honestly decode binary, and then continue to get the message back to Earth, we're in trouble. For all we know, they could be living among us now. We're but gerbils in the world of the Altair. Doom. Doom. DOOM. who knows what's the meaning of that message in their lang ? imagin it means "hey ! come and blow up us" !! i think so. it can be dangerous. heh , hollywood can make a film about this article ! Its a waist of time anyway. Think about it, if there really are 'advanced lifeforms' in space, why would they waist their time on our crappy, dieing planet?!? Oh, great, not even alien civilizations are free from spammers. First listen, then send. Now, we might be at risk. If they exists, they might be good people, but what about if they are hostile?. Alright, let's be optimistic. But next time, please, listen first before send another message out there with information about us. Hope NOT some alien douche receive it on his Spacehotmail and deleted the goddamn messag because he sees it as useless. Or sent it everywhere on his planet and be in four days inside a psychiatric hospital. The main question is: If there are more advanced and intelligent lifeforms close to our galaxy or galaxies wouldn't they have sent us an e-mail first? Or something beyond our limited imagination which look like e-mail? Think about it. We are always looking for more advanced lifeforms because less advanced makes our day a black curse. If we find an inferior civilization it would be a big displeasure. Wrong, aliens are so rare on the universe. It's like finding a flee inside thousand piles of straw. Life on Earth developed by clear and sheer luck by a series of overly complex phenomena which later became sapient( well kind of, we aren't sapient anymore as Ancient Greeks). "Hirabayashi ... sent the message via a US radio telescope in 1983". Why Hirabayashi did not write about antenna site and diameter and about power of transmitter? I don't believe him! HAWS.NET » Alien e-mail reply to arrive in 2015?